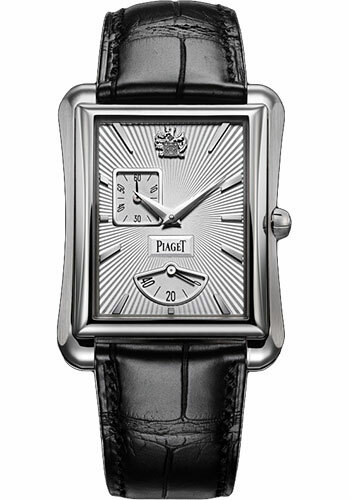 32 x 41 mm 18K white gold case , reverse tonneau shape, 9.2 mm thick, silvered dial with sunburst guilloche motif, hours markers and Piaget coat of arms in 18K white gold, 551P automatic movement with power reserve indicator, approximately 45 hours of power reserve, black alligator strap, ardillon buckle. Water resistant to 03 ATM. 32 x 41 mm 18K rose gold case , reverse tonneau shape, 9.2 mm thick, silvered dial with sunburst guilloche motif, hours markers and Piaget coat of arms in 18K rose gold, 551P automatic movement with power reserve indicator, approximately 45 hours of power reserve, brown alligator strap, ardillon buckle. Water resistant to 03 ATM. 32 x 41 mm 18K white gold case set with 171 diamonds (approx. 2.1 ct), 9.6 mm thick, diamond bezel, silvered dial with a guilloche sunburst motif encases the white mother of pearl counters and hour markers in 18K white gold, 551P automatic movement with power reserve indicator, approximately 45 hours of power reserve, black alligator strap, ardillon buckle. Water resistant to 03 ATM. 32 x 41 mm 18K rose gold case set with 171 diamonds (approx. 2.1 ct), 9.6 mm thick, diamond bezel, silvered dial with white mother of pearl and 18K rose gold hour markers set with 34 diamonds and Piaget coat of arms in 18K rose gold, 551P automatic movement with power reserve indicator, approximately 45 hours of power reserve, brown alligator strap, ardillon buckle. Water resistant to 03 ATM.